I am so glad you are here today. It really does a heart good! So thank you all so very much! Doesn't it just sing "SUMMER TIME!" 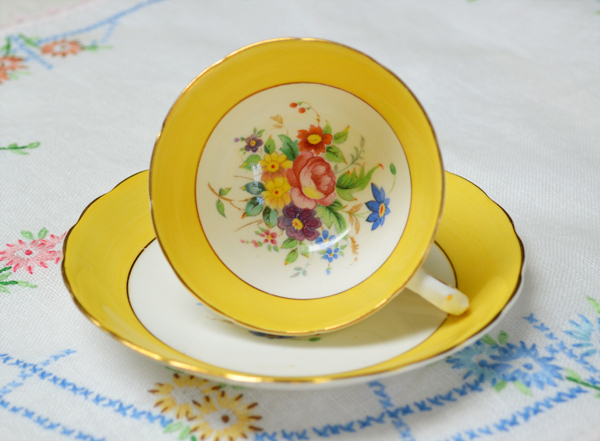 The saucer has a sweet grouping of flowers and a lightly scalloped edge. This little demitasse was a gift from sweet Kim at Tabby's Place. She surprised me out of the blue! And I have been enjoying it ever since. This adorable cup just fits in my hand. It was made at the Potteries in Longton, England, where so much of the English china was made. The company that made it was Tuscan, and it was manufactured as early as 1947, but maybe as late as 1969. 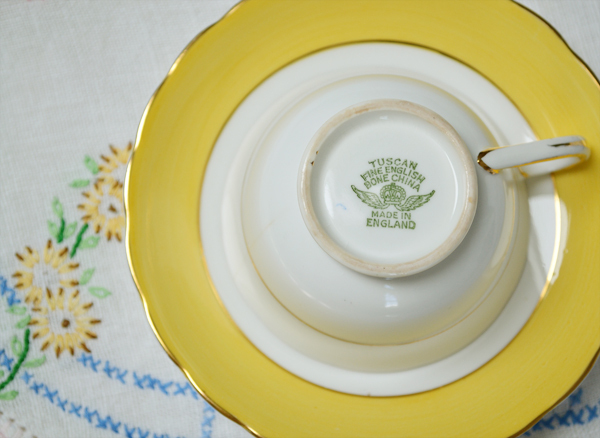 The Tuscan company eventually became part of the Wedgwood group. It is such a bright and pretty cup! 8 more days until I pick winners for my Joyful July Giveaway! you only need to be a follower to enter. I enjoyed your tea cups! I purchased a bright yellow one last week by Mayfair. What pretty teacups, Terri! How sweet to receive one as a surprise gift! I do love the chintz one of course. You know me and my chintz; can't get enough of it! Lovely post and thanks for sharing. Wishing you a delightful week. My grandma had one of those yellow cups! Wonder where it ended up (certainly not in my hands, unfortunately). What beautiful cups you are showing this week. The yellow one with the flowers inside is so lovely. I don't own any like that and I think I need to start collecting some! I've always loved chintz and yours is so pretty, perfect for summer teas. Thank you for hosting and have a great week. Gorgeous teacups! You are SO right- they spell out summer in the best possible way! I love the bright and cheery yellow! And Rosina is always a favorite. Beautiful Terri! Have a great week. Thx for hosting, sweet friend. Happy Tea Day! 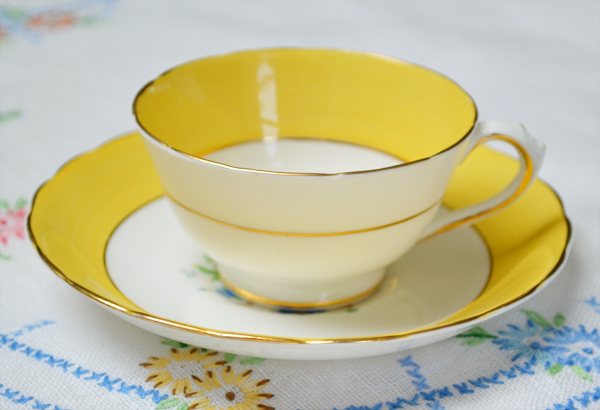 I hope you don't mind me joining you today with a teacup card :-) Your summertime teacups are so pretty. I love the pretty chintz. Thank you for hosting and may your week be off to a great start. 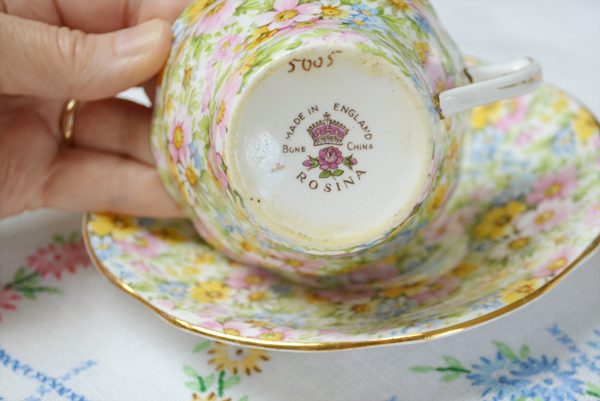 Love your Rosina tea cup - and I have a similar one at home - visiting wee ones this week, so I can't run and check! A beauty none the less! You certainly developed your own style of tea cups! The beautiful Tuscan yellow one shows definitely your trademark :) but the chintz one also fascinates me! 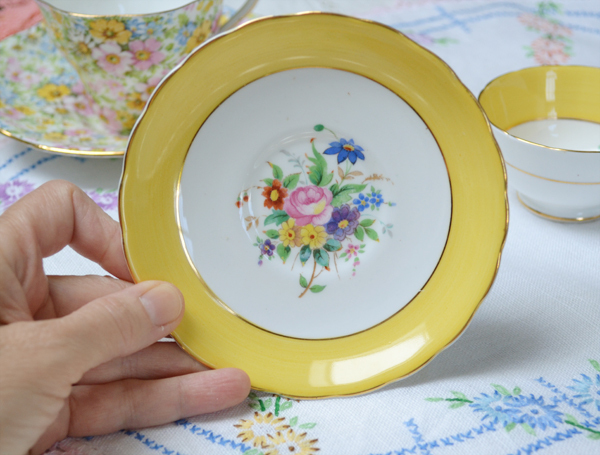 The yellow colour on porcelain is not very usual, so... more treasures to keep! Such a cheery and beautiful tea cup! 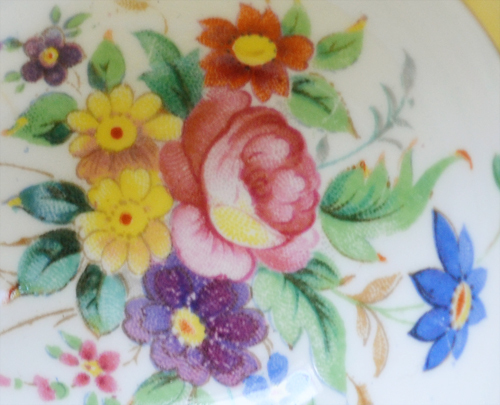 My grandmother had a chintz tea cup that I was fascinated by when I was a child. 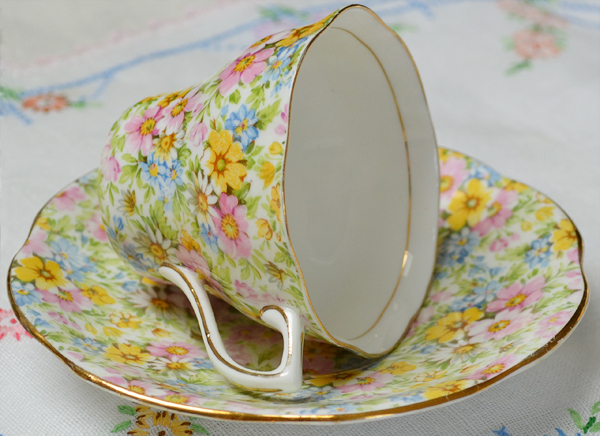 Hi Terri....I must say that I absolutely adore your ROSINA tea cup! Loved all your summertime teacups. Love the yellow cup with the bouquet inside. What a nice surprise that was for you. Isn't Mail Call wonderful??? 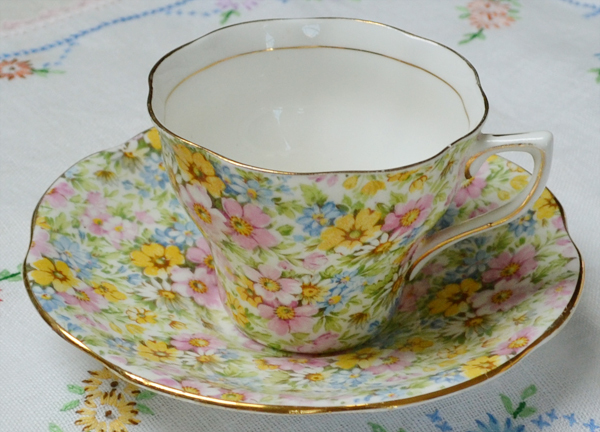 The chintz cup is just too pretty! Happy Tea Day! Oh Terri, both the cups are beautiful, but I prefer the second one, it is just so beautiful with all those flowers! Summer has finaly come to France, and now it is so hot, I m happy to leave Paris tomorrow for a long weekend in my house in Picardie!I heared it is very hot where you live. I hope you can cope with it. Love! Totally summertime tea cups..so bright and poetic..from a story book scene! Beautiful!! Wishing you a fabulous week Terri! You have another beautiful post! Your Tuscany and Chintz teacups are beautiful. I love the yellow and floral bouquet. So cheery! Thanks for hosting. Both of these floral teacups are cheerful and pretty! Really perfect for a summertime tea! Two perfect cups for summertime! Gorgeous teacups Terri! I especially love the Chintz! I hope you are enjoying your summer! Hi Terri...love your cups, each and every one of them. I featured a Rosina on this week on my blog. I like that company.